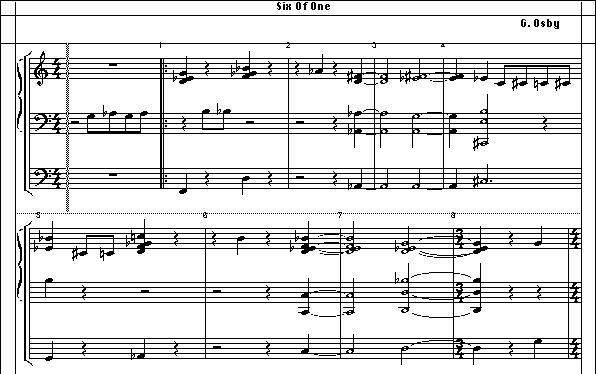 The vertical groupings in this composition structures are in a typical "Jazz style" voicing format. However, many of these structures do not directly adhere to the common standard of notational labeling. I named the structures in a fashion that I thought would be commony understood to Jazz improvisers. In this case, it will be necessary for each performer to decipher these groupings and label them according to their reasoning of what they think the voicings should be called. It has been my experience that everyone comes to entirely different conclusions, which ultimately affects how they will improvise. 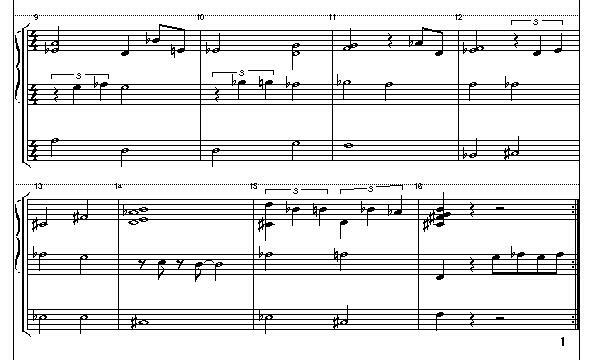 Upon recording this piece, my group improvised on the structures exactly as written - without the usage of typical notational symbols or chord "changes". As a saxophonist, I find that this approach removes me from the standardized frame of thinking and it changes my improvisational perspective completely. This method of vertical structure identification during a solo excursion will most assuredly guarantee that one will refrain from reliance on prepared or contrived material or melodic content. The discipline to do such is very demanding and requires a great deal of focus and preparation. Chord symbols often require that musicians recall memorized material or "licks". The objective here is to improvise on the actual voicings and sound of the composition and not to progress in a chord to chord or bar by bar manner. It has been my experience that several personalized conceptual options must be created and embraced to insure that redundancy and repetition in improvisation can be avoided. Another option would be to attempt a purely thematic approach in which the player would refer to the written content at key points during the improvisation. These snippets of the theme would serve as melodic soundposts and will also ground the solo somewhat. This method will be effective for players who opt to take a departure from the changes completely.